These little critters can be hard to miss. Not only are they extremely tiny but they really don’t make much noise. Well that is, until they do. In Minnesota, there are seven different species of bats around. At Minnesota Wild Animal Management, Inc., we can handle them all. Serving Minneapolis and the surrounding suburbs, we are experienced in handling bat removals safely and in a timely manner. Did you know that bats are the only mammals that can fly? This unique trait allows them to swoop into attics and roof lines in and around your home. Why do they do this? Typically, they are only in search of a place to nest and sleep. Even the smallest space, like ⅜ inch, grants the ability for bats to finagle their way into your area. 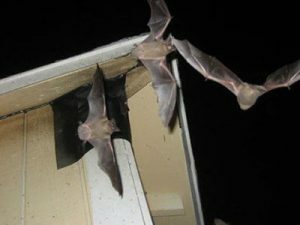 Siding, roof lines like the soffit or fascia, roof overlays, chimneys, and vents are all areas that bats love to rest. So what makes them so bad anyways? The issue that makes these flying mammals threatening to humans is their ability to carry and transmit diseases. It is typically common knowledge that bats can carry the deadly disease known as rabies. If you are bitten or come into any contact with a bat, get ready to load up on rabies shots to avoid the disease. FYI, it isn’t pleasant. The other unfortunate disease that bats possess is Histoplasmosis. This disease is found within their stool. When bats defecate, they leave what’s called bat guano. This guano has the potential to grow deadly spores that must also be removed. Bottom line, bats within your home are not a good look for you and certainly not good for your health. So how do we get these animals out? Our professionals at Minnesota Wild Animal Management, Inc., has the experience and expertise to safely and efficiently remove these bats. Through proper inspection and execution techniques, we can get the job done while protecting your family. All you have to do is give us a call. We will come out and inspect the area, remove the problem, repair any damage the bats may have caused, and then perform preventative measures so that this problem does not happen again! We are so confident in our work that we offer individuals in Minneapolis and the surrounding suburbs a four-year warranty that bats will not return to your home. For more information about bat removal, contact Minnesota Wild Animal Management, Inc., today at (612) 237-8282.